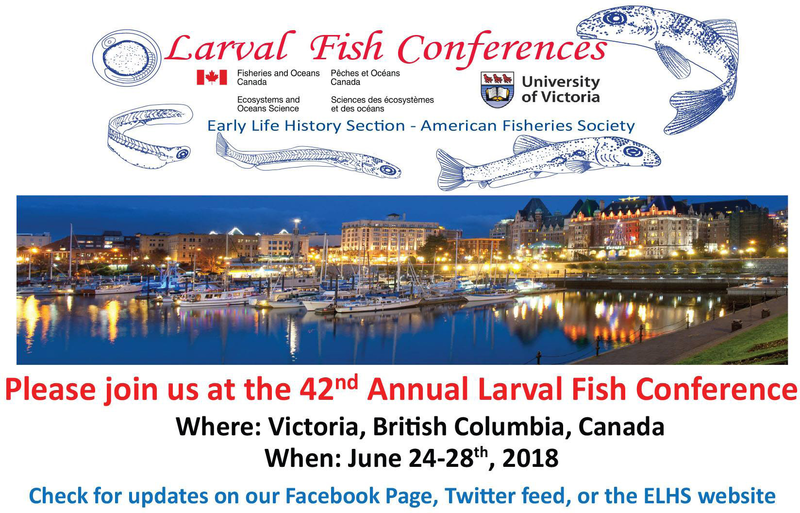 The 42nd annual Larval Fish Conference (LFC) will be held from 24-28 June 2018 in Victoria, British Columbia, Canada. The meeting is being organized by John Dower ([email protected]), Francis Juanes ([email protected]) and Pierre Pepin ([email protected]). Victoria is located on Vancouver Island and can be reached via connections through Vancouver and Seattle airports as well as via car ferries and high-speed catamarans. The Delta Victoria Ocean Point Resort, located on Victoria’s inner harbour and just a five minute walk to downtown Victoria, will serve as the venue for the conference. A block of 75 rooms has been set aside for conference participants. 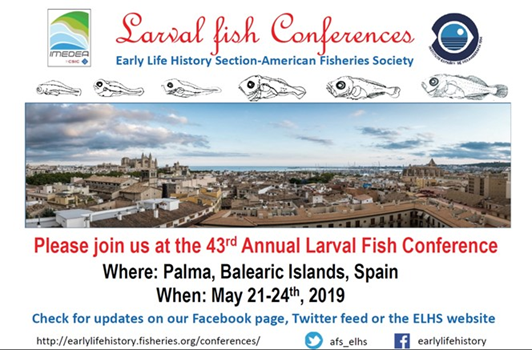 Book the group rate room for the Larval Fish Conference at https://tinyurl.com/ybto2qvc . Students looking to share hotel accommodations can submit a request through the organizers who, with the help of Alison Deary and Marta Moyano, will coordinate requests. There will be four full days of presentations (Monday through Thursday), with a poster session on Monday evening and a social event at the University Club on Wednesday evening. The LFC 2018 website is located at http://lfc-2018.com/. Registration and abstract submission deadlines have been extended to March 23 2018. Registration will be $600 CDN (~$480 USD; ~€400) for non-students and $300 CDN for students. Janet Duffy-Anderson (NOAA, Alaska Fisheries Science Center, Seattle, WA USA) will present the conference keynote address. There will be five theme sessions:  There is life (and death) after metamorphosis: Recent advances in the ecology of juvenile fish;  Fisheries oceanography in a changing ocean;  Predator-prey interactions and consequences to growth-survival;  Emerging threats to ELH stages and potential consequences to physiological processes; and  Application of ichthyoplankton data to fisheries management. There will also be a contributed paper session. A special mentoring session aimed at Early Career Scientists will be hosted by Alison Deary ([email protected]) and Marta Moyano ([email protected]) on the afternoon of Sunday June 24, 2018. Stuart Ludsin (Co-director of the Aquatic Ecology Laboratory, The Ohio State University) will be providing a 3 hour tutorial on proposal writing (see attached PDF). A one-day Larval Fish Identification Workshop will be held on the campus of the University of Victoria by Peter Konstantinidis ([email protected] – Oregon State University, Dept. of Fisheries and Wildlife), Alison Deary (NOAA, Alaska Fisheries Science Center) and Moira Galbraith (Fisheries and Oceans Canada, Institute of Oceans Sciences) on Saturday 23 June, 2018. Participation will be limited to 15 people, with students having priority. Details will soon appear on the website; in the meantime, see the attached PDF.